Monday: All You Can Eat Pizza Just $4 per person: ALL DAY. Wednesday: Enjoy a Large Cheese Pizza or Any Pasta Dish for Just $5! Thursday: Family Fun Pack: Get a large 2-topping pizza, up to 4 fountain drinks, up to 4 rounds of mini golf and unlimited use of our play structure for Just $19.99! Fridays: BOGO Large Pizzas Lunch and Dinner, Plus FREE Facepainting from 5pm-7pm Every Friday! Mini-golf: 5$ per Adult and 3$ per Child, Unlimited Play. Play Structure: 1$ for a one year old. 2$ for a two year old. $3 for three years and up. Laser Tag: 6$ per person for the first round, 4$ per person for each additional round. Mini Bowling: 12 Credits (3$). Bumper Cars: 14 Credits ($3.50). Pizza Putt Auction bidding has started! Click here to bid! We are having an online auction that will go live on April 17th 2019. It is an ONLINE ONLY auction. You can start bidding about 10-12 days in advance, but it will be LIVE on the 17th of April around 2PM You are welcome to come in and check out the inventory at any time, and there will be a formal inspection the Monday/Tuesday before the auction. There will not be information available at Pizza Putt, please see the BRamsey website for any information regarding the auction. If you cannot find the answer you are looking for please email carrie.nhes@gmail.com and I will do my best to answer your questions. Pizza Putt is officially CLOSED permanently. Vermont’s largest indoor soft play structure is packed with many unique features including slides, rope ladders, swinging platforms and more to keep the little ones entertained for hours! Our 9-hole indoor mini golf course features a Wonders of the World theme and offers both fun and challenging play for all ages and skill levels. Our Glow in the Dark Lazer Tag arena has recently been updated and now offers an exciting menu of different objective-based play to choose from. Two lanes of mini-bowling featuring electronic automatic scoring and pin indicators. Fun for all ages …. It’s like modern candle pin bowling with smaller bowling balls and pins. Gutter rails for the tikes and many fun variations of games for the adults. Practice your swing, or just have a ball in our fun and challenging Batting Cage! We are constantly adding New Games to our Arcades and feature some of the newest and exciting games on the market today! We have a wide variety of immersive video games, including a roller coaster simulator, many large racing simulators which move to the action, and many different carnival style games! From air hockey games to ticket-winning games we have something to delight and challenge everyone from children to adults! For a limited time come experience the giant 4 Player Halo Fireteam Raven ….. the only one in Vermont !!!!!! Nothing beats the excitement of playing to win! We have more Ticket-bearing games throughout our arcade than anywhere in VT, for children and adults alike including DC Comics, Giant Space Invaders, Fruit Ninja, Circus Ball drop, Fish Bowl Frenzy, Quick Drop, Willy Crash, classic Skee-Ball games and more. Win tickets and claim prizes from THE LARGEST Prize Center in VT.
Tee off with one of our delicious appetizers including wings, mozzarella sticks, nachos, boneless wings, and more. Our menu includes fresh salads, juicy grilled items, hot oven grinders, delicious wraps, pasta dishes and of course hot, fresh homemade pizzas – from traditional pizzas to a menu full of artisan specialty pizzas. Our pizza dough is hand-stretched and made fresh in-house daily. All pizzas are made-to-order with fresh toppings and only the best ingredients. We use only fresh, whole-milk Mozzarella and Our toppings include pepperoni, honey ham, sausage, meatball, bacon, onions, green peppers, black olives, mushrooms, tomato slices, broccoli, garlic, hot peppers, pineapple, anchovies and Cajun spices. We also have garlic butter crust upon request. We also offer a full, Gluten Free Menu! Our re-usable, reloadable Players Passes are your Passport to FUN! 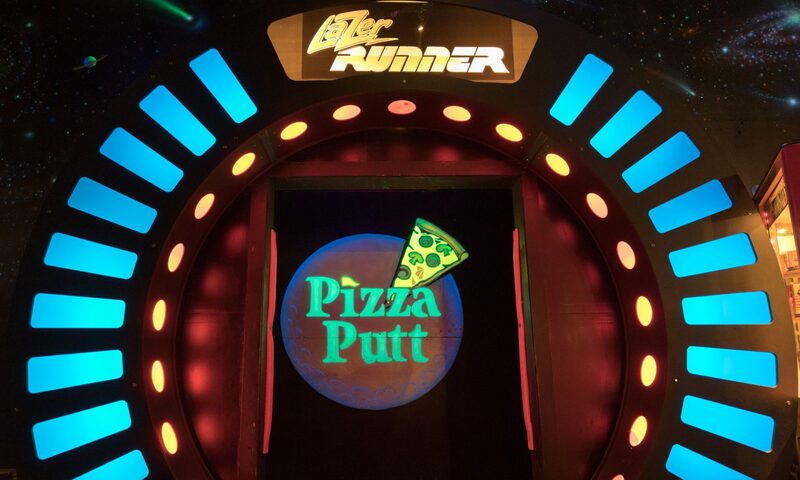 The Players’ Pass is used instead of quarters or tokens to place credits in most ticket, arcade and table games throughout our facility, as well as Laser Tag, Mini Bowling and other activities. You can “reload” your Players’ Pass and add additional credits at any time! Done playing and still have credits left on your card? Take it home with you and bring it back with you on your next visit, or give to a friend – Players’ Passes make a great gift card for any occasion and your credits will never expire. Available at kiosks throughout Pizza Putt or at the Prize Counter, you may purchase pre-loaded Players Passes in various denominations. Our Players Passes are a great value! While at most arcades 1 credit = $0.25 cents, with our Players Pass system, the more credits you purchase, the less each credit costs, with an average credit being as low as just $0.18cents! For our returning customers, once you spend a total of $100 on your card you will become a VIP Player where each game costs less to play!